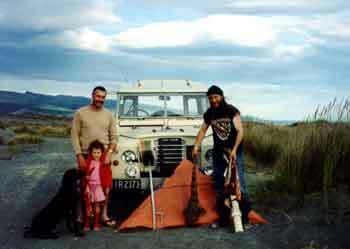 In New Zealand there are a wide range of prevailing weather conditions that local kitefishers can capitalise on. If you are uncertain of what sort of prevailing wind and seasonal weather to expect in your area, then this New Zealand weather information is essential to assisting you in making a choice of fishing kite and fishing rig. If you are still uncertain as to the best rig or kite for your area after reading this New Zealand weather page, please call us or drop us a letter or email. We will be only too happy to help you. To assist you in choosing the best kite for your area we have put together the following weather information based on feedback from thousands of Paul's Fishing Kites' customers from all around New Zealand. While it is the terminal tackle which catches the fish, it is the quality, size, weight and design of the fishing kite you choose which will ultimately determine how many fishable days you get. The main objective with choosing a fishing kite is to ensure the fishing rig is balanced and capable of fishing in the winds in your area. This means the kite must be large enough to tow out the gear that you intend to fish, but not so large that it breaks the line or is too difficult to retrieve. As a rule of thumb, because the upper North Island is a narrow landmass, the wind strengths on the lee shores are stronger than the offshore winds further south. This is because the further wind travels over land and the higher the landmass is, the weaker the wind becomes. The fishable winds on the open west coast are northerly, north easterly, easterly, and south easterly. When the weather is from the northerly quarter it deflects offshore around 20 degrees when it strikes the west coast. The longshore rip on the west coast, which usually travels from south to north, often assists kitefishers in northerly wind conditions. This means northerly quarter winds are very easy to fish as less tacking of the kite is required. 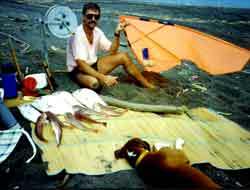 When the wind is from the south-southeast quarter the wind deflects 20 degrees onshore and additional tacking of the kite is required. Left: Three big snapper and several gurnard caught at Dargaville. A further complication in addition to the weather is the longshore rip on the west coast which generally comes from the south. This rip is at it's strongest when the surf is at it's highest. Kitefishing from the west coast when the wind is southeast and the surf is up can be more difficult for those using kite powered Bottom Longlines (see choosing a rig). Experienced Kite Dropper Rig fishers have few problems fishing southeasterlies as their mainline is not in the water so it is unaffected by the rip. The best fishing weather on the west coast are either the easterlies associated with the top of a high pressure weather system or the bottom of a low pressure system. Low pressure system winds are usually much stronger than high pressure winds. On the east coast from North Cape to Coromandel there are many extensive beaches as well as numerous bays and inlets frequently fished by kitefishers. Because the coast has so many good beaches which lay at different angles, all westerley winds can be easily fished. In addition, there are many penninsulas and points on this coast that can be fished in just about every wind direction. With the extensive clear beaches of upper Northland, the most popular systems in this area are the Bottom Longline Rigs. 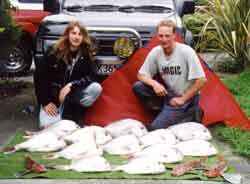 Areas such as Tokerau, Bream Bay, Pakiri, Omaha and Orewa frequently produce good numbers of snapper. The best kites on the large rigs in this area are the light wind range of delta kites such as the Nighthawk or Delta Force. The Bay of Plenty down to Opotiki has few prominent coastal features and can only be fished in westerly weather at the northern end closer to Coromandel through to southerlies and south easterlies at the southern end near Opotiki. Offshore winds in the entire Bay of Plenty region are generally less than 30 knots so prospective kitefishers should choose kites that perform best in light winds. Strong wind kites, such as the Super Kite, are unnecessary in these areas. Ultra light wind kites such as the Mega Mouth and Power Chute really come into their own in the Bay of Plenty. Nighthawk and Delta Force Kites are a popular choice also, especially during strong wind years when southwest wind flows are the prevailing weather. From East Cape to Wellington offshore winds are inclined to be either very strong and associated with storms, or very light as cold morning air flows offshore from high inland areas. Kites at either extreme are recommended for the most common weather patterns in this area. 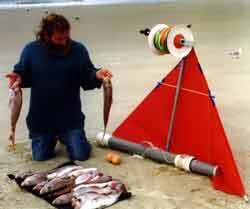 For example, on large rigs a Super Kite for the strong winds and a Power Chute for the light winds. Skyhooks which are designed to improve mid range performance are not necessary in this area. 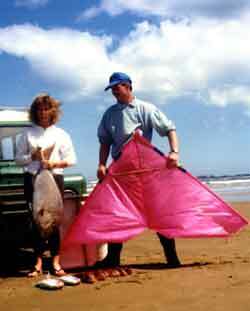 On smaller rigs the Flexiwing Kite is recommended. This Kite covers both light and strong winds. Alternatively both sizes of the Pocket Sled Kitesare reccomended on very small rigs as the Large Pocket Sled will cover light weather conditions while the Small Pocket Sled Kite will fish heavier weather. The lower west coast of New Zealand's North Island has the same weather conditions as the upper North Island except the wind strength is far less because of the width of the island and the height of the central plateau landmass. Kites like the Nighthawk and Skyhook, or on smaller rigs the Large Pocket Sled or Flexiwing Kite, are the best general pupose kites for the weather in this area. For those who wish to fish the light morning breezes the Mega Mouth or Power Chute Kite will give many additional fishing days. Those with Flexiwing Kites can also take advantage of these light wind opportunities by adding a Flexiwing Skyhook to their rig. The Southern Alps shed cold air from dawn till 10 or 11am in calm conditions. The wind is generally from 4 to 10 knots and light wind kites are essential to effectively fish these breezes. When the prevailing weather is offshore, then this cold offshore wind effect amplifies the wind strength. For those stronger wind days a Nighthawk Kite is more manageable than the sheer brute force of the Power Chute or Mega Mouth Kites. Those with smaller rigs will find the Large Pocket Sled, the Flexiwing Kite and the Flexiwing Skyhook ideal in this area. The Southern Alps can at times generate a near gale to gale northwesterly offshore wind. Only the Super Kite for the larger rigs, or the Flexiwing Kites on smaller rigs can effectively handle these extreme weather conditions. At other times the offshore winds in this area are inclined to be on the lighter side. Kites such as the Nighthawk, Delta Force and Power Chute are best in these light weather conditions for those with large rigs. Pocket Sled fishers should have both the Large and Small Pocket Sled Kites in order to take advantage of most wind conditions except the extreme gales. 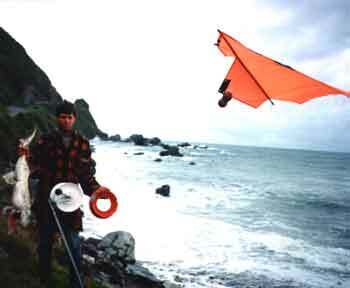 The Flexiwing Kite, because of its unique design, can handle whatever the winds can throw at it when operated by an experienced kitefisher. The Flexiwing Skyhook is an advantage for those lighter wind days, but is not essential in this area. The two major weather patterns that should influence the choice of kites are El Nino and La Nina. La Nina brings cyclones and tropical depressions. The associated easterly quarter winds with this weather can be very strong. When La Nina is the prevailing condition strong wind kites such as the Super Kite will give extra fishing days on the west coast. Conversely, El Nino easterly quarter winds are usually on the top of high pressure systems and are much lighter. Kites with better light wind performance such as the Nighthawk, Delta Force, Power Chute and Mega Mouth are recommended during these years. El Nino usually lasts for several years and brings a lot of westerly quarter winds. La Nina may only last one or two years but it brings the fresh to strong easterly winds that make for unbelievably good fishing on the west coast. Often these easterlies will prevail for weeks at a time. La Nina generally delivers southwest winds during the winter while El Nino is inclined to be more variable with good spells of easterlies often occurring between May and September. With both La Nina and El Nino, easterlies are more predominant over summer. 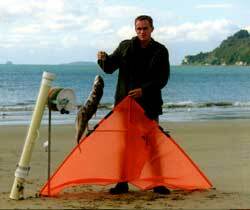 Paul's Fishing Kites has a complete range of fishing kites to suit all of your needs and New Zealand weather conditions.